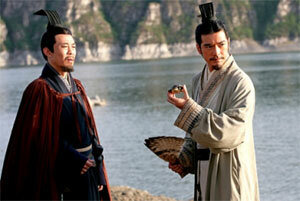 (left) Chang Chen and Tony Leung Chiu-Wai, and (right) Hou Yong and Takeshi Kaneshiro in Red Cliff. The Skinny: Entertaining and solid, though perhaps a notch less than the stunning masterpiece everyone hoped for. Still, there's a chance that John Woo's return to Asian film will come through. This is only the first of two Red Cliff movies, and the second film may deliver on the first film's promise. Let's all cross our fingers. It's big, entertaining, and the only game in town. Red Cliff is your 2008 Chinese summer blockbuster of choice, whether you like it or not - after all, there really isn't much else in Chinese cinemas this summer. John Woo's adaptation of the classic Romance of the Three Kingdoms - which is available in novel, TV drama, video game, and unlicensed collectible variations - isn't as compelling as it is merely large. Woo slants the source material towards his pet themes, front-loads the production with big stars and big names, and assembles a spectacle that's respectable, involving, and absolutely worth a look. What the film doesn't provide is the compelling emotion that has punctuated many a Woo production, and the film's climax doesn't serve up the "wow" factor that one expects of a film of this scale. But any disappointment could be premature; Red Cliff is only the first of two films, and Woo could be saving the best for last. One would hope, anyway. But first, the answer to the million dollar question: yes, this film does have pigeons. Woo's trademark white birds are present and accounted for, appearing in a couple of scenes, including one very pivotal shot near the end of the picture. The birds never seem gratuitous (unlike in some other Woo works) and will only prove distracting to snarky Woo-familiar audiences checking their watches to see when the birds finally appear. The birds don't really appear much; instead, audiences get a healthy helping of other popular Woo signifiers, namely brotherhood, honor, and that sweaty, blood-pumping bond between heterosexual men. The men in question are essayed by some very solid actors, starting with Tony Leung Chiu-Wai and Takeshi Kaneshiro, but there are women too, including Vicki Zhao Wei and, in a much-ballyhooed role, Taiwanese model Lin Chi-Ling, who plays Xiao Qiao, the supposed "most beautiful woman in China". Judging by her competition in the film, she earns that title handily. Likewise, Red Cliff's competition at Chinese cinemas can't compare to Woo's massive production, as it provides the expected solid spectacle, complete with big battles and some well-integrated visual effects. The film starts at the Battle of Chang Ban in 208 A.D., with general Liu Bei (You Yong) leading a group of refugees in retreat from the encroaching armies of conniving Prime Minister Cao Cao (Zhang Fengyi). Thanks to some strategy from Liu Bei's fan-carrying strategist Zhuge Liang (Takeshi Kaneshiro) - not to mention an assist from warriors Zhao Yun (Hu Jun), Guan Yu (Ba Sen Zha Bu), and Zhang Fei (Zang Jingsheng) - Liu Bei and his people are able to get away. However, the conflict isn't over yet. Cao Cao's lust for power continues unabated, and one getaway won't be enough for Liu Bei and his people. In order to combat Cao Cao, Zhuge Liang heads to the Kingdom of Wu to enlist their aid. However, Wu leader Sun Quan (Chang Chen) is torn on whether to act, as his cabinet is seemingly of two minds. Zhuge Liang instead attempts to sway Sun Quan's most trusted advisor, Zhou Yu (Tony Leung Chiu-Wai), currently presiding over the soldiers at the river port of Red Cliff. Zhou Yu is a smart strategist and an obviously very honorable man. When we're finally introduced to the character (Tony Leung does not appear until way into the film's two-hour plus running time), John Woo takes care to demonstrate his honor in broad, romantic strokes, defusing a potential conflict among his soldiers AND sharing his love for music all in a single scene. Zhuge Liang is immediately charmed (or perhaps smitten) and begins sending Zhou Yu charged, hopefully heterosexual looks. After an evening of jamming on their qins (Chinese stringed musical instruments), the men are already on the same page, and without even uttering a word of agreement. Can this pair of awesome, deadly handsome strategists overcome Cao Cao while also keeping their man-passion in check? As expected, the men manage to keep their relationship chaste. The homoeroticism in Woo's films can border on giggle-inducing, but the director has always portrayed his manly affections effectively. John Woo is not a realistic film director; his films are romantic and even simplistic, going for emotional themes that are personal, rather than universal or political in significance (Bullet in the Head being the obvious exception). Woo eschews larger ideas for the personal in Red Cliff, subjugating sweeping historical context for a positive portrait of brotherhood - a move that almost amounts to a subversion of expectations. Modern variants of this genre usually involve a critical look at war, revelations of political corruption, plus the acknowledgment of a tragic human cost. Warlords is a perfect example of the type of war epic that would normally get made in today's cinema climate. It's got brotherhood, but political machinations and the lust for power and women usually send that righteousness careening off a cliff. In the end, war brings out the worst in us all. Not so in Red Cliff. In this film, war is unfortunate, but also necessary and honorable, because it's where you become a man and fulfill your destiny. Even more, it's where men meet other men who became men because of war (Got that?). Zhuge Liang and Zhou Yu begin a mutual admiration society thanks to their keen understanding of warfare, Zhou Yu goads Sun Quan into war by hinting that he should assert his manhood, and men from opposing sides smile and nod appreciatively at the effort and honor of their foes. In a scene also depicted in the recent Three Kingdoms, Zhou Yun rescues Liu Bei's infant son A Dou from the clutches of Cao Cao's men, and Cao Cao immediately admires the resourcefulness and strength of this hero on the other side. In Three Kingdoms, the scene was used to demonstrate the coolness of Andy Lau's character, but in Red Cliff it's another chance for John Woo to be John Woo. The director creates pronounced intimacy between men using emotionally charged gazes, revealing close-ups, and thoughtful use of camera and editing. There's Woo aplenty in Red Cliff, from the use of music to the slow-motion, freeze frames, dissolves, and other techniques, and he gets his emotions and themes across well. It's the character work that makes Red Cliff fun, not to mention a welcome return to the John Woo style, which was muted to the point of nonexistence in his Hollywood work. The film largely does away with politics and historical significance, amps up the themes of honor and brotherhood, and gives its source material respectful, largely faithful treatment. There are still some debits, as some of the populist themes scream "approved by China". Also, the film relies too much on the audience's previous knowledge of the Three Kingdoms characters; uninitiated Western audiences may have some trouble following who's who, especially if they're not played by recognizable name actors. However, fans of Koei's Dynasty Warriors video games could find Red Cliff to be easily accessible, because the characters are as iconic in the film as they are in the games. Woo keeps his action very grounded, but these guys are most definitely heroes, possessing kickass battlefield presence and the ability to take on dozens of men simultaneously without breaking a sweat. The action is largely confined to the beginning and the end of the film, but it's entertaining, well-done stuff. The Battle of Chang Ban offers more chaotic thrills, as Zhao Yun goes chasing after Liu Bei's son, and there's a healthy helping of slow-motion action, grounded fight choreography, and manly charisma from Hu Jun. When the Battle of Red Cliff rolls around, however, it's strategy city, as the film concentrates on Zhuge Liang's plan: an ingenious defensive formation that basically owns Cao Cao's vastly huge force. The battle is a little off-putting - after all, it's a smaller force dominating a bigger force via cold-blooded strategy, with the "good guys" standing on a pedestal somewhere watching the bloodshed approvingly. Still, this is a meticulous and fascinating depiction of war, and much more interesting than the smudge slow-motion chaos of Three Kingdoms. A part of the source material's appeal lies in the involved strategy perpetrated by the legendary characters, and Red Cliff delivers that very satisfyingly. There's also some action featuring the film's biggest star. For some odd reason, Zhou Yu still finds the need to run into battle, if only to give audiences a chance to check out Tony Leung mixing it up. Leung is charismatic and very handsome as Zhou Yu, and never overplays his character's charm or intelligence. He's nicely complemented by an earnest, well-cast Takeshi Kaneshiro, though the actor is a bit more self-conscious in his role than Leung is. 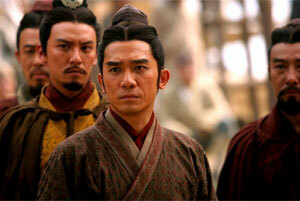 Tony Leung doesn't dub his own Mandarin - a negative since we all know what he sounds like. He and Kaneshiro's performances are quite solid, however, and John Woo curiously does not get overwrought with his characters or their emotions. The most emotional performance may be from Lin Chi-Ling, who's required to look like she's misting over at any given moment. Woo wrings a decent performance from the model, and Zhang Fengyi is all smug confidence as would-be tyrant Cao Cao. The supporting actors are fine, with Hu Jun making a less showy, but more physically powerful Zhao Yun (a.k.a. Zhao Zilong) than Andy Lau did in Three Kingdoms. For Japanese cinema fans, actor Shido Nakamura shows up and overacts with his nostrils and eyebrows.